Gulf Shore Boulevard is not just about real estate, its a lifestyle. It is the piece-de-resistance of Naples. As its name implies, this six-mile stretch of gentle curves is the grand boulevard on which Naples’ beachfront properties are located. Gulf Shore Boulevard begins its southward journey just below Clam Pass Park and Pine Ridge Road. Approaching the north end of the boulevard, it is only fitting that one must pass the Waterside Shops, the modern, ultra-upscale shopping venue that features high-end retailers whose names define the luxurious lifestyle of the residents of Gulf Shore. A trip down Gulf Shore Boulevard takes travelers past some of the most luxurious high-rise condominiums anywhere in the world, and some of the only ones in the world from where the spectacular Gulf of Mexico sunsets can be thoroughly enjoyed. 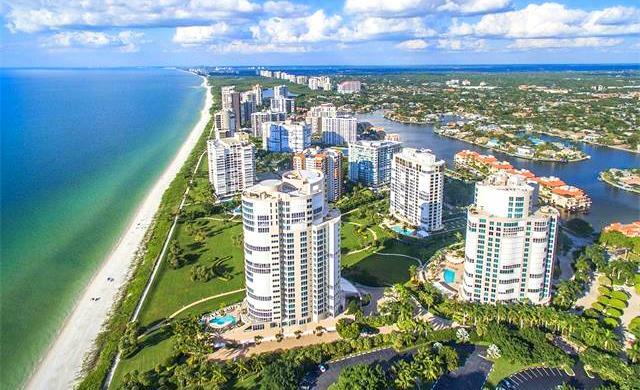 Gulf Shore Boulevard is undoubtedly the place where the greatest collection of expensive and elegant homes in all of Southwest Florida may be found. Moving south from the Village on Venetian Bay, more high-rise condo building come into view, including Savoy, Allegro, and the magnificent Brittany that is home to 127 units on 21 floors. These are followed by a series of mid-rise buildings, such as St. Croix, Naples Continental Club, Madrid Club, Regency Towers, Imperial Club and Harborside in the Moorings community. These are followed by the luxurious Lausanne, Westgate, and Lions Gate. To visit the south end of the Boulevard, head north a third of a mile and turn right on Harbour Drive. Drive another third of a mile, passing the Commodore Club on the way. Then turn right again onto Clayton Road. Continue south to the Moorings and turn right onto Mooring Line Drive. As Mooring Line Drive takes a sweeping curve to the left, it becomes, once again, Gulf Shore Boulevard. Having rounded the bend, mid and low-rise condos, beginning with Chateau and Royal Palm Club line both side of the road. Other venues, such as La Tour Rivage, Palm Bay Villas, Bella Baia, Naples Cassamore and the splendor of Sancerre appear as Gulf Shore Boulevard departs the Moorings and continues into the community of Coquina Sands. Having just entered Coquina Sands, Loudermilk Park, with public beach access, is on the right. Banyan Boulevard heads inland, turning into 12th Avenue North as it crosses to the east side of US 41 (Tamiami Trail). Less than half-a-mile south, just past Surfside Club, Gulf Shore Boulevard passes through the Naples Beach Hotel & Golf Club. In between are the midrise condo neighborhoods of Del Mar, Parador, and Eleven Hundred Club on the east and Laurentians, Colonial Club, Whitehall, Via Del Fino, and Bahama Club. As Gulf Shore Boulevard passes South Golf Drive, it enters Olde Naples where single-family homes and ultra-elegant estate homes that, when priced for sale, can be in the tens of millions. These exquisite homes line the boulevard all the way to the end at 20th Avenue South.